What is The Exceptional Foundation of East Alabama? 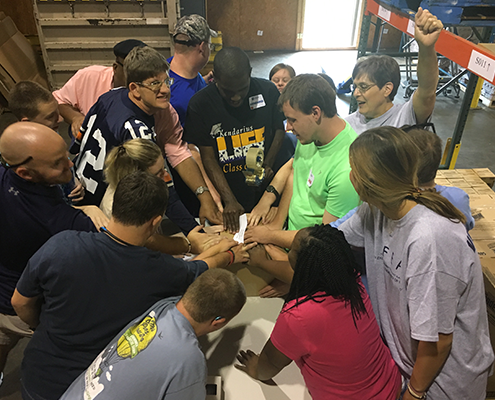 The Exceptional Foundation of East Alabama is a nonprofit organization established to serve individuals with intellectual and developmental disabilities and provide opportunities for the participants to thrive and be engaged in social and recreational activities. Who participates in the program? The participants are individuals with intellectual and developmental disabilities who meet the established criteria. The Exceptional Foundation of East Alabama does not provide transportation to and from our facility, but does provide transportation for scheduled field trips. Contact Lee Russell Transit at 334-749-9092 for inquires regarding possible transportation. All participants bring their own lunch from home. Why is there a need for an Exceptional Foundation of East Alabama? The need for our services within this community is great. With high numbers of local individuals with special needs, an increased number of families that have relocated to our area due to school-aged services, and the number of families in need of support, the Exceptional Foundation of East Alabama offers services to those families and individuals in a number of ways. How does the Exceptional Foundation of East Alabama offer support to families of participants? The Exceptional Foundation of East Alabama offers respite to caregivers, and provides a caring, safe place for loved ones during the day. This alleviates hardships, as caregivers are able to work with peace of mind knowing that their loved ones are cared for during the day. How can I support The Exceptional Foundation of East Alabama? You can make a donation or volunteer your time! If you’re interested in submitting an application for your family member to The Exceptional Foundation of East Alabama, visit our application page. Current Exceptional Foundation of East Alabama parents and guardians can get important information on our Parents page. The Exceptional Foundation of East Alabama is a 501 (c)(3) organization. Our tax ID# is 45-5344209. All contributions are tax deductible as allowed by law.